German as a foreign language worldwide. Promoting German as a foreign language abroad is one of the foremost tasks of German cultural and educational policy. It makes a significant contribution to matters of fundamental importance to the future of German society, such as the internationalization of Germany as a locus of higher education, training and innovation as well as securing skilled labour for the future. Learning German abroad, moreover, opens a window on Germany and imparts certain social values. The survey of the number of German learners worldwide is an important source of information in promoting German as a foreign language abroad. It is an assessment of trends and developments in interest in the German language worldwide. Data acquisition was done in local working groups, consisting of German embassies, the Goethe-Institut, the Zentralstelle für das Auslandsschulwesen, the Deutsche Akademische Austauschdienst and partially other partners on the spot. The Goethe-Institut took care of the central editing of the data. More people are learning German in Poland than in any other country in the world. All told, Poland has 2.3 million German learners, 2.1 million thereof in schools. Poland and Germany are closely intertwined in economic and cultural respects as well as in terms of civil society. The wide range of existing exchange programmes, scholarships, higher education opportunities and greater career prospects in German companies in Poland or Germany significantly boosts the motivation to learn German. Reviewing the trend in recent history, German underwent a rapid upswing in the 1990s, starting with 1.07 million German learners at Polish schools (15% of pupils) in the 1991/92 school year, to reach the current level at around the turn of the millennium. In view of the demographic trend in Poland, this enormous increase was not a matter of course. The Polish education system is beginning to suffer from a pronounced demographic decline. It is estimated that the population will decrease from about 38 million in 2010 to 36 million by 2035. This trend is having far-reaching consequences, including the closing-down of educational establishments, particularly in economically underdeveloped and rural areas, and a drop in the number of teaching staff. Under these difficult circumstances, however, German has kept a steady hold on its second place in foreign language learning: 90% of Polish schoolchildren learn English, 40% German, 5% Russian and 3% French. While total school enrolment in Poland has dropped 25% over the past five years, the number of German learners at Polish schools has only gone down by 8% during that period. The Polish school system has undergone widespread reforms in recent years, including the requirement of a second mandatory foreign language, from which German has benefited most. English took its place as first foreign language several years ago. Furthermore, Polish schools have been given more freedom with regard to scheduling. School principals are making the most of that in the wake of rapidly diminishing enrolment. The demand from parents and pupils and the resulting shifts in the curriculum often tend towards reinforcing the first foreign language, mathematics and natural sciences, which are important for intermediate exams in Polish secondary schools. German skills are excellent wherever German is learnt as the first foreign language at Polish schools, but on the whole rather mediocre due to the often small number of hours per week allotted for the teaching of a second foreign language. On the other hand, a large number of hours per week are set aside for the second foreign language at schools specializing in foreign language instruction, including those receiving assistance and support from the ZfA, where pupils can qualify for the KMK Level II (DSD II) German language certificate, as well as at bilingual schools. The demographic decline has not failed to leave its mark on Polish universities either. Enrolment is down in every subject. Out of 1.6 million students, a total of 96,555 (approx. 6%) are learning German. The vast majority of them (87,300) are learning German as an elective, while 9,255 students are enrolled in German studies. The DAAD assists German instruction at Polish universities through a network of 20 lectureships and 5 language assistantships. The Goethe-Instituts in Poland have noted a trend in their language courses: many (young) adults seek to improve their career prospects by learning or improving their German, often picking up where their German instruction left off at school some time before. A further increase in the number of German learners in Poland does not seem attainable at the moment since school enrolment is plummeting due to the demographic trend and since German as a foreign language, with its high relative share of learners, has probably reached a saturation limit for the time being. After the Goethe-Institut's Deutschwagen tour, tour, which in recent years has promoted German learning at schools nationwide in a very lively manner with support from the DAAD, improving the quality of German skills will increasingly be to the fore in the years to come, e.g. through advanced teacher training, scholarships and innovative teaching projects. The close ties based on the partnership between Germany and France have given rise to a great many joint initiatives in schools and higher education. Since their Joint Declaration in 2003 on the 40th anniversary of the Elysée Treaty, promoting the partner language has become a central element of Franco-German cultural cooperation. The French education system fosters multilingualism and free choice of foreign languages at school. Close to 1 million pupils are currently learning German in French schools: 8.6% and 15.2% of the pupils in primary and secondary schools, respectively. From 1995 to 2005, the number of secondary school pupils learning German dropped by roughly one third in favour of English and Spanish, but it has remained stable since then. The so-called classes bilangues, a project launched in 2002 by the French Ministry of Education in which, starting in the first year of secondary school, pupils learn English and German simultaneously, have considerably helped to stabilize the situation. The number of German learners in these classes has increased by 125% since 2004. At present, 88.6% of German-learning pupils in France are in these classes bilangues. Evaluations show that a significant number of the pupils in these classes are more successful in learning foreign languages than those learning only one foreign language. Since 2011 the Goethe-Institut has been developing teaching materials for these classes on its website and providing pointers on how English and German teachers can work together to generate synergies. There are a wide range of reasons for choosing German: traditionally, what counts now as in the past for the parents, who ultimately make the choice of language(s) for their children, is the argument of improving their educational and career prospects. Moreover, classes in which German is taught are still often regarded as the stronger classes. Pupils with an immigrant background also see the choice of German as conferring the advantage of a superior social status. The Goethe-Institut France makes a significant contribution to enhancing the appeal of German through continual publicity campaigns carried out in concert with the German teachers’ associations, other intermediary and partner organizations, cultural organizations and the French Ministry of Education. A booklet setting forth good arguments for learning German is annually updated and distributed to all French schools in cooperation with the French Ministry of Education. Since 2006, following a decision by the Franco-German Ministerial Council in October 2004, the KMK Level I (DSD I) German language test is given in French schools at levels A2 and B1. In 2014 close to 35,000 pupils took the test at about 2,300 schools. In addition, a double diploma combining the German Abitur and the French baccalauréat (AbiBac) is offered at 82 French schools. In 2013, on the 50th anniversary of the Elysée Treaty, France and Germany agreed to continue aligning their educational systems. In 2014, the first Franco-German training programme was launched at a vocational school in Bordeaux. A great many mobility programmes within the framework of vocational education and countless exchange opportunities offer an additional incentive for choosing German as a foreign language, as does the wide range of programmes at the Franco-German University. This year’s survey for the first time provides exact, albeit incomplete, figures on French higher education. 1,203 students are currently enrolled in German studies programmes at 33 universities, and 965 students are studying to become German teachers. 125 universities, moreover, offer German as an elective, though the number of German learners in these courses could not be ascertained. With over 40 lectureships, the DAAD fosters German studies programmes and German language tuition at French universities, as well as the teaching of other subjects relating to Germany through subject-specific lectureships. Various factors (retirement, increased demand etc.) have led to a 25% decline in the number of German teachers at French schools in recent years and, consequently, to a shortage of German teaching staff. The French Ministry of Education have now taken steps to remedy the situation, carrying out additional selection processes and hiring over 200 supplementary German teachers. The Goethe-Institut is increasingly involved in providing advanced training to new teachers. With a view to developing early learning of the partner language, the Franco-German Agenda provides for the establishment of 200 bilingual day-care centres by 2020. The position of the German language in the Russian Federation has been stable for about three years: 8-9% of all pupils there learn German at school. The absolute figures, however, have further decreased since the last survey in 2010. All in all, some 1.5 million people are learning German today, as against about 2.3 million German learners five years ago. The number of schoolchildren learning German has dropped from 1.6 million in 2010 to 1.1 million. The reasons for this decline are manifold. School structures are rapidly changing, especially in rural areas: more and more schools are being closed down or merged, hence a reduction in the number of schools offering foreign language instruction. The number of schools offering tuition in German as a foreign language has gone down from about 22,600 in 2010 to a mere 16,800 now. More and more urban schools are joining the trend towards English as the first foreign language. Nevertheless, interest in learning German remains widespread, as evidenced by the large proportion of pupils still learning German as their first foreign language (87% of German-learning pupils). The ZfA and the Goethe-Institut provide assistance and support to 111 PASCH schools in Russia. At the schools assisted by the ZfA, demand for the KMK Level I (DSD I) German language certificate in 2014 was up 68% on the previous year. 971 and 648 pupils took the DSD Levels I and II tests respectively in 2014. Furthermore, there are roughly a thousand school twinnings between Germany and Russia, which quite significantly foster dialogue between young people in the two countries. Now in the past, pupils are not required to learn a second foreign language at Russian schools, though it is recommended under the new educational standards. This is in large part thanks to effective promotional efforts like the Goethe-Institut’s “Lern Deutsch” campaign. Against this backdrop, the figures for German as a second foreign language are showing an upwards trend. At 38%, German is the most widely taught second foreign language at Russian schools. Like the country’s schools, a large number of universities are being merged or closed down in the wake of the Russian educational reform. The winners here are the scientifically-geared universities, the losers are clearly the underfunded liberal arts universities. This is currently leading to a drastic downsizing of German and other language and literature departments and to a decline in the number of students majoring in German, compounded by a marked reduction in state-funded places for students to do German studies. To counteract this downwards trend, the DAAD is providing significant support for German studies at Russian universities in the form of 35 lectureships at present and a great many projects. German retains a relatively stable position, on the other hand, as an elective foreign language at university (where, as in Russia’s schools, it faces keen competition from English) and as a second foreign language. Unlike the schools, however, there are no official sources for higher education statistics, so we had to fall back on polls at Russian universities. Over the new few years, the figures are likely to hold steady at this level (assuming the prevailing conditions remain unchanged). That will necessitate increased efforts, however, in the area of basic and advanced German teacher training to ensure that there will be a sufficient pool of new teachers, for one thing, and to safeguard the quality of instruction, for another. So all our partner and intermediary organizations have agreed to make efforts to promote professional and academic orientation towards German teaching in secondary and higher education with a view to bolstering motivation to learn German and counteracting the downward trend of the figures in the public education system. German remains the third most popular foreign language at American high schools and universities. Viewed in terms of the number of German language programmes and population growth in the US, however, German is tending to lose ground. Our observation of the trend of German as a foreign language in the US shows that interest in learning the language depends on geopolitical and socioeconomic factors. German descent, which up to the end of World War I virtually guaranteed that children would learn the language of their parents and grandparents, hardly figures at all since then in choosing which foreign language to study. Teaching foreign languages, moreover, is not a high priority of US scholastic and educational policy. Roughly 20% of American pupils learn a foreign language, which in many high schools can only be studied for two years. More intensive language acquisition is possible in some immersive programmes and Saturday schools. The absolute number of German learners at American schools has remained stable at about 400,000 pupils since the last survey in 2010. So after Spanish (6.5 million learners) and French (1.3 million), German ranks third in foreign languages taught at US schools. Concomitantly, due to across-the-board budget cuts at state and local levels, a great many German programmes have been discontinued now that fewer schools can afford language programmes. This development is compounded by ever-increasing competition from other languages, such as Chinese. At many of the remaining schools that do offer German, on the other hand, there are more pupils taking German classes now than five years ago. German programmes are offered where some interest in German instruction exists, particularly among the parents. This is why personal decisionmakers (parents, pupils) and structural decisionmakers at schools (principals, school counsellors) are the targets of German intermediary organizations’ efforts to boost motivation (through the German-as-a-foreign-language youth portal, concert tours etc. ), of educational policy lobbying and information efforts (e.g. by the network of German advisors in the US) and of Goethe-Institut promotional campaigns such as “Just Add German”. The value of advanced training programmes for German teachers should not be underestimated, as they are vital to fostering the next generation of German teachers. The situation in higher education has to be regarded in nuanced terms. Of the roughly 21 million students currently enrolled in American colleges and universities, a little over 96,000 are learning German, about 8,000 are enrolled in German studies and about 88,000 in elective language courses. This represents a 2.2% increase on the last survey. However, the number of German learners compared to the overall number of all foreign language learners in US higher education is dwindling (from 11.3% of all foreign language learners in 1990 down to 5.7% in 2009): i.e. despite increasing absolute figures, the trend is towards a smaller percentage of students learning German. Unfortunately, the German language is likely to continue to face mounting competition from other foreign languages offered at US colleges and universities in the foreseeable future. The importance of German instruction offered in higher education curricula lies chiefly in the circumstance that graduates of most higher education programmes in the US are required to have taken two years of college-level foreign language courses, which makes German an elective requirement for the majority of German learners. In higher education the DAAD pursues a two-pronged strategy for German as a foreign language, which includes direct and indirect measures to promote German (e.g. language courses, advanced teacher training, linking German to engineering studies) as well as efforts to improve the competitiveness of German in foreign language course offers by foregrounding appealing subject-matter that relates to Germany. The statistical trend of German learning in Brazil is positive in every respect. Young adults in particular are increasingly coming to realize that foreign language skills markedly improve their career prospects in a globalized world economy. Furthermore, foreign language acquisition is bolstered by an interest in academic cooperation as well as by the presence of German companies in Brazil. All in all, roughly 135,000 people in Brazil are learning German. German speakers in areas with considerable German immigration are a special feature of the country. In these areas of the states of Espírito Santo, Paraná, Rio Grande do Sul and Santa Catarina, German is the second official language in some communities, and German classes in school are required in a few of these communities. But this has only a slight impact on the current positive trend in the number of German learners. As a matter of fact the importance of German as an immigrant language is actually declining. German Foreign Minister Steinmeier’s “Schools: Partners for the Future” initiative, advanced teacher training programmes and the latest “Year of Germany” (2013/2014) in Brazil under the motto “Where ideas connect”. Most German learners (roughly 10,000) at university take German as an elective. This clearly indicates an interest in learning languages for specific purposes and a striving for international access in higher education. One central element is the Brazilian government’s “Science without Borders” programme, whose object is to internationalize research and universities. In its first phase from 2011 to 2014, this scholarship programme brought over 4,000 undergraduate and graduate students to Germany, all of whom must acquire certified German language skills. The universities cannot meet all of this demand owing to a shortage of qualified teachers. The figures in adult education have nearly doubled. More than 42,000 Brazilian adults are now learning German. The huge demand is attributable to a general boom in education, for one thing, as well as the demand for German instruction at universities, for another. On the whole, interest in language courses has grown markedly in recent years. This goes for German, too, for the above-mentioned reasons. Students account for by far the largest group of participants in German courses outside of universities as well. Besides improved language skills, which are important for the subject-matter of their studies (e.g. literature, music, philosophy), more and more students are also keen on improving their qualifications for the job market by acquiring German language skills. This factor has substantially grown in importance lately, partly in view of the large enrolment figures (4.5 million students at “brick and mortar” universities). The main challenge in promoting German as a foreign language here is still to consolidate the substantially increased demand through effective skills-improvement and advanced training programmes for German teachers and through the structural expansion of language and scholarship offers for German learners. The activities of the DAAD, the Goethe-Institut and the ZfA, in the areas of promoting the German language and German studies, training German teachers at universities, and further training of German teachers through specific measures of assistance, fit together quite sensibly here. The Brazilian government are planning to round out their large-scale internationalization programme “Science without Borders” with a “Languages without Borders” programme and, in this connection, to specifically promote the German language as well. This will provide an opportunity to sustainably consolidate the growing interest in German. The steady growth in the number of German learners in Chinese schools, universities and adult education attests to the growing importance of the German language in the People’s Republic of China. The underlying factors and causes of this steadily mounting interest are manifold. Generally speaking, education traditionally rates high in Chinese society. And with the country’s dynamic economic development, more and more resources are becoming available for education. In higher education alone, the absolute figures have risen 24% since the last survey in 2010. German is, after Japanese, one of the most popular second foreign languages in China. All told, a little under 45,000 students are learning German today, and they can essentially be broken down into two main groups. One group learn German in language courses, as a minor, elective or compulsory subject or as a course chosen in the theoretical part of their vocational training. The other group comprise students of German studies, graduates of training programmes for interpreters or studies focusing on Germany in combination with another subject. The growth in German learners is also reflected in the rising number of German studies departments: whereas in 2009 there were fewer than 60 universities offering German studies, they are now (as per 2014) offered at 104 universities nationwide. The number of students in German studies programmes is currently estimated at 22,000. Chinese students are now the largest group of foreign students in Germany: 25,564 Chinese students were enrolled in German universities for the 2012/13 winter term. In 2014 close to 9,000 Chinese applicants took the test of German as a foreign language, which is recognized by all German universities as proof of language proficiency for admission to higher education. At Chinese middle schools, German is now, after English, the most widely learned European foreign language, and tending further upward. 123 schools nationwide currently offer German classes. With the exception of Hong Kong, they all receive assistance and support from the Goethe-Institut and ZfA. This is partly related to the launch and expansion of the PASCH initiative and a growing demand for foreign languages besides English. Against the background of an educational policy to bolster multilingualism, many parents here pick German (due in part to the persistently positive image of Germany). From the perspective of school principals, expanding the curriculum to include German fits in with the desire to internationalize that is increasingly observable in Chinese schools. Drives like the German-Chinese Language Year of 2013/14, as a campaign to promote German, further augment the visibility and appreciation of the German language. In the sphere of higher education, the past five years have seen a rapidly growing number of cooperation projects and twinnings of both universities and German studies departments, as well as the physical presence of various German universities in China. One current example is the recently established liaison office of the Darmstadt Technical University at Tongji University in Shanghai. Model Sino-German facilities in higher education also figure prominently, e.g. the Chinesisch-Deutsche Hochschulkolleg (CDHK, Chinese-German College for Postgraduate Studies) and the Chinesisch-Deutsche Hochschule für Angewandte Wissenschaften (CDHAW, Chinese-German Polytechnic for Applied Sciences) in Shanghai, which offer bilingual studies with accredited German and Chinese double bachelor’s programmes. These go hand in hand with various events and conferences designed to nurture academic exchange. The Chinese now regard Germany as the most important non-English-speaking country for studies abroad. This trend is shored up by various scholarship programmes (DAAD programmes) as well as some bilateral programmes, e.g. the Sino-German Postdoc Scholarship Program, which enables young academics to travel to Germany for research purposes. In general, the number of German learners is growing outside of universities as well, among adults and in the non-scholastic educational sector. A series of large-scale events over the past few years has attracted widespread interest and raised awareness of Germany among the Chinese public at large. Over the new few years the number of German learners is expected to continue developing along the same lines if prevailing conditions remain unchanged. To accompany this steady growth, however, increased teacher training efforts will be necessary to secure the next generation of German teachers and the quality of instruction. India is a nation characterized by multilingualism: in addition to Hindi and English, 21 other languages are recognized by its constitution. Against this background, interest in the German language has nevertheless grown tremendously over the past few years in India. There are many reasons why. In the wake of the opening-up of its economy in the early ’90s and its rapid economic development since then, India is interested in internationalization and linking up with its partners in every sphere of political action. As a result, interest in learning foreign languages is growing as well. Germany is one of India’s main trading partners, the prevailing image of Germany is generally positive and German technology carries enormous prestige there. Working in any of the roughly 1,800 German companies in India or traveling to Germany to work or study here are attractive prospects for more and more young people in India. In 2014 a total of 107,000 pupils at about 700 schools received instruction in German alongside English and Hindi. In 2010 the number of German learners in the nation’s schools only came to 18,550 pupils. This massive upsurge in secondary school demand for German was partly triggered by the PASCH activities. The 58 PASCH schools in India, which receive guidance and support from the Goethe-Institut and the ZfA, are for the most part private schools. Two of these schools, however, are part of the Kendriya Vidyalaya Sangathan (KVS) state school system. Thanks to a Goethe-Institut initiative, this led to the ambitious goal of introducing German throughout the entire school system. In August 2014, German was introduced at about 500 KV schools, with 78,500 German learners. The German Foreign Office and the Goethe-Institut are engaged in intensive talks with the Indian government and the KVS school system with a view to forging ahead with the successes achieved so far, albeit in a new political setting after the 2014 parliamentary elections. With a growing number of chairs at Indian universities offering German language or German studies as a degree course, the number of students in German studies has increased as well. The number of those learning German as an elective could not be ascertained in 2015. This figure was estimated at roughly 9,000 in 2010. For the reasons given above, this number, although not quantifiable, has also increased substantially since then. Alongside conventional German studies, the DAAD also supports the trend of taking up more practically oriented topics and putting greater emphasis on promoting German as a foreign language in the Indian higher education system. Setting up an academic course of training for German teachers is one of the most important medium-term goals because this is the only way of sustainably meeting the need for qualified German teachers in India. The basic willingness to work together to this end was agreed at the Indo-German Intergovernmental Consultations in 2013. Learning foreign languages will continue to be of great importance in India in future as well. This is attested by the number of people learning German at India’s Goethe-Instituts and Goethe Centers, among other things, where enrolment has increased by 36% over the past five years. The Association of Southeast Asian Nations and its associated countries seek greater political, economic and cultural cooperation. The ASEAN common market will be taking effect at the end of 2015. For German as a foreign language, this means greater competitive pressure within ASEAN education systems from the neighbouring Asian languages, which will be systematically promoted. 600 million people live in Southeast Asia, and the majority of them are under 25 years old. Germany is traditionally an important target country for members of the upwardly mobile middle class, who tend to place a premium on education, especially in Indonesia, Thailand, Vietnam and the Philippines. The ASEAN nation with the most German learners is Indonesia, with a total of 187,000, which corresponds to a 75% increase. The number of German learners at schools there has grown significantly by 52,500. The keen interest in German is also reflected in the network of 29 PASCH schools. German is increasingly popular at Indonesian universities as well. Germany is the number one destination in Europe, and number five worldwide, for Indonesian students. Thailand ranks second among ASEAN countries in terms of the number of German learners, with about 13,000, 70% of whom learn German at university or in adult education. Thanks to tradition and the prevailing positive image of German education and the German economy, the authorities and the general public show a steady interest in German, hence the moderate rise in the number of German learners. Noteworthy positive developments at Thailand’s universities include well-established new degree courses primarily in technical German and a growing interest in German compared to other European languages. In Vietnam the number of German learners is undergoing a dynamic increase (+50%) similar to that of Indonesia, though in considerably smaller absolute terms. It was not until 2013 that German was officially admitted by ministerial decree as a (first or) second foreign language at liberal arts schools. The Goethe-Institut and ZfA assisted the Vietnamese Ministry of Education in putting together a syllabus for German instruction in 2014 and now provide local support and assistance to 12 PASCH schools. Multilingualism and, as a result, second foreign languages are steadily making inroads, including in higher education, e.g. at the Vietnamese-German University in Ho Chi Minh City. The growing demand in Germany for skilled works in nursing and health care (see also “Skilled Labour Initiative”) within the context of occupational migration is boosting interest in learning German in Vietnam as a key qualification. The numbers of German learners in Malaysia and Singapore have likewise seen rapid growth, by 77% and 38% respectively, though at low absolute levels. A total of 5,700 German learners were counted in the Philippines. Under a 2011 agreement with the Ministry of Education, German has been introduced in foreign language instruction at nine public schools and 25 teachers have received advanced training from the Goethe-Institut. The reasons for the growing overall number of German learners are increased demand for German courses for nurses interested in seeking employment in Germany, as well as spousal immigration and, to a lesser extent, the popularity of German higher education. In Cambodia, German is so far offered only at the Kambodschanische-Deutsche Kulturgesellschaft (Cambodian-German Cultural Society) in Phnom Penh. The number of course participants there increased by 46% to 718 German learners between 2011 and 2014. Cambodian students are first beginning to show an interest in learning German as an elective at university. The figures for Laos are very low, at only 38 German learners. 590 people are now learning German in Myanmar, 278 of them at university and 312 at the new Goethe-Institut that opened up in 2014. Many are motivated by a desire to study and research in Germany. This is reflected in rising numbers of applicants for DAAD grants as well as markedly greater interest in cooperation with German universities. The number of German learners in Turkey has seen vigorous growth, particularly in the country’s schools. Thanks in part to various scholastic reforms, instruction in German as a foreign language figures far more prominently now than just a few years ago. Under the school reforms legislated in 2012, foreign language instruction has to be provided at state schools starting in the 2nd grade (previously in the 4th) for two hours a week and, starting in middle school, for four hours a week. The first foreign language taught at Turkish schools is almost invariably English. The second foreign language can be taken as an elective in middle schools from the 5th grade on. Foreign language instruction is intensified at the 2,000 so-called Anadolu state secondary schools, where pupils are required to study a second foreign language for at least two hours a week from the 9th grade on. The second foreign language is German at over 90% of the Anadolu secondary schools. At about 40 Anadolu schools, German is offered as a first foreign language and some courses in other subjects are taught in German as well. A ZfA consultant and another 22 teaching staff placed from Germany assist in the teaching of German as a foreign language as well as in the teaching of other subjects in German. Within the framework of the PASCH initiative, moreover, 20 partner schools receive support and assistance from the Goethe-Institut and another 17 partner schools from the ZfA. In 2014, 465 pupils earned a Level I German language certificate (DSD) and 228 a Level II DSD, which is recognized as proof of language proficiency for admission to German university. From 2013 to the present, after years of stagnation, the Turkish Ministry of Education have recruited 1,300 German teachers. The Goethe-Institut supports these new recruits with a comprehensive programme of advanced training in teaching German and specific subjects in German, a programme developed in close consultation with the Turkish Ministry of Education in order to optimize their entry into the teaching profession. Students at university are required to take a foreign language, but no statistics are kept regarding the languages taught and the number of learners. Higher education is developing at an impressive pace in Turkey. The state universities, for example, are planning to create 250,000 additional places to study in bachelor’s programmes every 5 years, not least in view of the rapidly rising demand for higher education and the planned internationalization of teaching and research at Turkish universities. These developments accord with the international orientation of the country’s educational elites and the desire of many students to study for at last a few terms abroad. Since Turkey began taking part in European mobility programmes, Germany is one of the most popular destinations for Turkish Erasmus students: 2,472 Turkish students came to Germany in the 2012/13 academic year. The DAAD maintains a nationwide support network for Turkey’s universities. DAAD lecturers and language assistants teach at 18 Turkish universities and at the Turkish-German University in Istanbul, which opened in September 2013. Instruction in German as a foreign language remains of great importance for purposes of spousal immigration, even if the nationwide figures are decreasing on the whole. Private language schools are increasingly important in this sector alongside the Goethe-Institut. Overall, the three Goethe-Instituts in Turkey report a steady increase in demand for German courses. In this period of political upheavals and despite the slump in tourism, the number of German learners in Egypt has more than doubled over the past five years from 120,000 to 250,000. One of the main reasons for this huge increase is the demographic trend. Another factor could be the educational reform under the 2014 constitution, which provides that all Egyptian citizens be accorded educational opportunities. The number of German learners has gone up, especially in Egyptian schools. With more and more pupils choosing German, Egyptian schools reported 229,420 German learners for the 2014/15 school year. 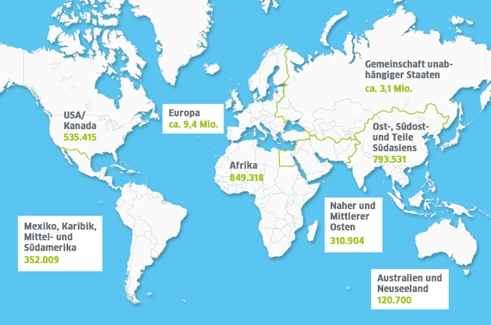 German as a foreign language is taught at roughly 5% of the country’s schools, which, however, are located in only 16 of the 30 government districts. Nationwide, 32 PASCH schools receive assistance and support from the ZfA and the Goethe-Institut. A distinction must be drawn, however, between level of proficiency in and relative importance of a foreign language: a mere 3% of schools with German instruction offer German as a first foreign language and attain to a proficiency level of B2 – they are essentially the 7 German Schools Abroad and the 7 DSD schools in Egypt. There has been only a slight increase in the number of DSD certificates (DSDI/DSDII) awarded. Most DSD tests are taken at the German Schools Abroad. The Goethe-Institut provides support and assistance to 18 so-called Fit Schools, where instruction in German is currently being set up or expanded, as the case may be. The vast majority of public and private schools with German instruction offer German as an elective requirement for pupils in grades 10 through 12. A proficiency level of A1 is reached there, which corresponds to the target level on the Egyptian exam for university admission. The number of German learners at universities has remained virtually constant since 2010. A little over one-third of the students learning German are enrolled in a German studies department. The subject is well established at Egyptian universities and produces outstanding graduates in interpreting and translation as well as in other German studies disciplines. The demand for foreign language electives (8,480 students) has increased since 2010, whereas the number of students in German teacher training (287) is small, since a degree in German studies, even without supplementary teacher training, is recognized as sufficient qualification to teach professionally. The proficiency level reached at the conclusion of this course of study averages A2. The trend in the number of German teachers, however, does not correspond to the growing demand. Furthermore, given the very low salaries by national standards, teaching is not an appealing profession. On the whole, however, German as a foreign language is increasingly popular at Egyptian universities, partly owing to the increasing appeal of Germany’s universities. This is also the reason for the growth in the number of learners in adult education. The Goethe-Instituts report somewhat fewer course participants, however, due to the large number of new rival language schools. This is clearly attested by the rapidly growing demand for external exams at the Goethe-Instituts. Skilled workers and college graduates need to pass the Goethe-Institut tests to take up studies, further training or employment in Germany. Demand is increasingly keen for the B2 test in particular, a prerequisite to begin working as a visiting physician in Germany and consequently to qualify as a medical specialist. Greater demand is also reported for the Start German 1 test in the context of spousal immigration. Cameroon is the country in Sub-Saharan Africa in which German is most widely learned and at the highest level. The number of German learners in Cameroon has grown steadily since the first survey in 2000. As of 2015, the overall number of German learners comes to about 230,000, 10% more than in 2010. The aggregate numbers of pupils have increased during that period as well due to the country’s demographic trend. German as a foreign language has consolidated and even increased its lead despite mounting competition from other languages (Spanish, Chinese, Arabic, Italian). All told, there are 2,133 schools offering German classes. The number of schools teaching German as a foreign language has increased rapidly in the wake of the liberalization of the country’s school accreditation policy, which has given rise to the establishment of a great many new private schools over the past five years. During the same period, the range of foreign language tuition offered in Cameroon has diversified. The language situation there, as in many African countries, is complex. The official languages in Cameroon are English and French. Spanish and German are traditionally included in the curriculum as the first non-national foreign languages. In the wake of the liberalization of the school system, Italian, Arabic and Chinese can now be officially included in the regular curriculum. For a year now, moreover, individual experimental schools have begun offering various national Cameroonian languages as well. After English, German is, along with Spanish, the first foreign language to be taught in the French-language school system that is not an official national language. German universities are stepping up efforts to woo students from Cameroon. In the 2012/13 winter semester, a total of 5.833 students from Cameroon were enrolled in German universities. This is about as many as students from France: each group accounts for about 2.9% of all foreigners studying in Germany. At the first German higher education fair there in June 2014, 1,300 Cameroonians interested in studying in Germany found out about the programmes offered in their departments from representatives of five German universities. This format is to be expanded over the next few years. The Goethe-Institut Cameroon prepares course participants specifically for studies in Germany. Course enrolment increased by roughly 65% from 2010 to 2014 and now comes to about 3,000 registrations per year. The DAAD runs an information centre in the capital and contributes to successful German learning there with two lectureships in the German studies departments at the Yaoundé I and (since 2013) Dschang universities. In the 2008/2009 academic year, a new teacher training centre was set up in Maroua. Ordinarily 30 students each year are admitted to the German teaching section: 20 for undergraduate studies and 10 for a Master’s programme. At present there are about 300 students there training to become German teachers. Approximately 120 1st–3rd-year students are enrolled in the general German department of the University of Maroua, which was started up in 2012. The basic conditions for promoting German as a foreign language in Cameroon are good, with comparatively good training for aspiring German teachers, an effectively organized network of German-as-a-foreign-language inspectors and teachers, and firmly established cooperation with the five PASCH schools.